Mon, Sep 8, 2014, 04:44 am SL Time, ColomboPage News Desk, Sri Lanka. 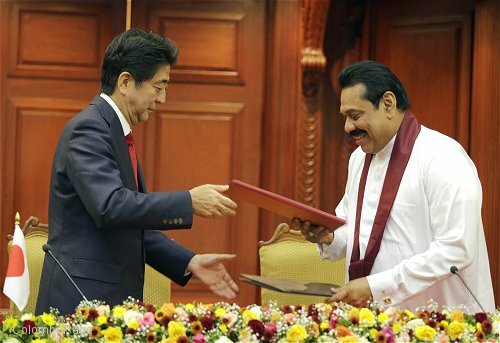 Sept 08, Colombo: Sri Lankan President Mahinda Rajapaksa and Japanese Prime Minister Shinzo Abe agreed Sunday to strengthen relations and develop a new partnership in the maritime sector during the bilateral discussions at the Presidential Secretariat in Colombo. Following one-on-one discussions, the two leaders joined their respective delegations for extended talks, which focused a considerable amount on strengthening relations between the two nations in the maritime sector and at international fora. "Our two countries, as maritime nations, recognize the importance of ensuring maritime cooperation and security," President Rajapaksa said. "I am pleased to note the close interaction between the defence establishments of our countries on this aspect." Prime Minister Abe said that, in addition to further strengthening the long-standing relations between the two nations, Japan also hopes to develop a new partnership with Sri Lanka in the maritime sector. "I wish to facilitate a policy dialogue at the senior level between our two foreign ministries," Prime Minister Abe said while expressing he is also interested in initiating a dialogue on maritime and oceanic issues. The Japanese Prime Minister also stated that Japan is willing to send experts to assist Sri Lanka's Coast Guard in capacity building. For potential collaboration, the two leaders also discussed disaster management, and the power and energy sectors. President Rajapaksa told Prime Minister Abe that Sri Lanka is interested in exploring options with liquefied natural gas (LNG). "Allow us to consider what kind of cooperation we could have with your country (in this area)," the Prime Minister said. Prime Minister Abe also welcomed Sri Lanka's adoption of the Integrated Services Digital Broadcasting-Terrestrial (ISDB-T) as its digital television broadcasting system. Sri Lanka and Japan had an Exchange of Notes for a Yen loan amounting to 13.717 billion Yen for the development of this project. Ways in which to enhance trade and investment were also discussed at the talks. 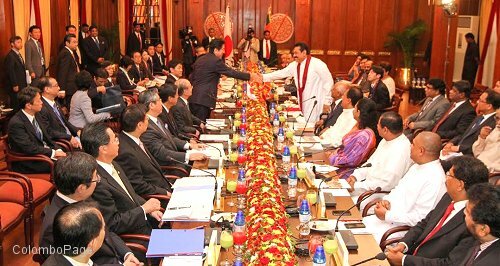 "Japan is an important market for Sri Lanka," President Rajapaksa stated. "I am pleased to note that the Bank of Tokyo Mitsubishi, UFJ, had become the first Japanese bank to enter into a Memorandum of Understanding with the Board of Investment (BOI) of Sri Lanka to encourage Japanese investments to my country." Both Sri Lanka and Japan expressed interest in better and closer cooperation in international fora, including United Nations Security Council reforms. "Sri Lanka shares Japan's position that the reform of the Security Council should include expansion of both permanent and non-permanent seats," President Rajapaksa said. "The enlargement of the Council and the reform of its working methods should lead to a democratic, more representative, accountable and effective mechanism, devoid of politicization." Prime Minister Abe appreciated Sri Lanka's support in this matter while also expressing "sincere gratitude for the assistance we received during the tsunami from the people of Sri Lanka. Both leaders also discussed the ongoing reconciliation process in Sri Lanka. "We appreciate the efforts you have made for national reconciliation in Sri Lanka," Prime Minister Abe said. Both leaders expressed a great interest in further enhancing the close relationship that the two countries have shared for a long time. The Prime Minister said Japan is committed to assisting Sri Lanka in its path to becoming an upper middle income nation. Japan is Sri Lanka's largest single donor of foreign aid and remained neutral at the UN Human Rights Council session in March when the body ordered an investigation into Sri Lanka's alleged war crimes. The Japanese Prime Minister is also scheduled to visit the Sri Lankan Parliament on an observation tour. He will be welcomed at the Parliamentary Complex at a special ceremony organized by Speaker Chamal Rajapaksa and Parliamentary delegates.